When a boy enters first grade at the age of 4 and high school at the age of 12, it's a foregone conclusion that the child will end up at a Harvard or a Stanford or a Cornell. Right? 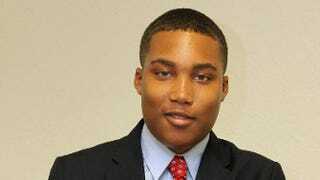 Not if the boy is Ralph Jones Jr., a 16-year-old freshman at Florida A&M University who has received national attention in recent days for passing up opportunities at the 45 other schools that accepted him — including the prestigious institutions listed above — to attend the Tallahassee, Fla., HBCU. Jones said that for him it wasn't about whether or not a school was an Ivy League — he thought about location, scholarship offers, campus atmosphere and the institution's engineering program in making his decision. "Entering college at the age of 16," Jones told The Root, "I think that my motives behind choosing were a little bit different than other people's. One, I looked at distance from home. Florida A&M is about 300 miles away from my hometown of Atlanta, so that was something that was really important to me, whereas if I had gone somewhere that was considered an Ivy, that would have been a good 2,000." The proximity is important because he is so much younger than the average freshman, he said. His parents have already had to drive down to his school twice from Atlanta to sign forms for him because of his age. He also said it's long been one of his goals to go to college for free. Many of his top choices were either too far away or did not offer him a full ride. Harvard and Stanford, for example, offered him some money but not a full scholarship. Cornell and Kettering offered full scholarships but were too far away for his liking. Georgia Tech, his No. 1 choice, did not offer a full scholarship. But what really sealed the deal for FAMU, which Jones said was his fourth-choice school, was a pep rally and recruitment fair he attended. To Jones, the atmosphere was "exhilarating." He said he comes from a long line of HBCU grads, and after that moment, his decision was made. Now that he's settled into his first semester at his new home, it's come as a bit of a shock to Jones that his choice of school has caused so much controversy. "The criticism has been overwhelming," Jones said. "[Talking to the media] was a big mistake on my part. I've never been under this kind of scrutiny before. Never nationwide like this. This is bigger than anything I've ever experienced." People found him through his Facebook and Twitter pages, and even sent text messages to his cell phone number, which was listed on his Facebook page. He said he received about 20 text messages from people who felt he had made a poor decision. Jones decided to write a note on his Facebook page to his detractors, explaining why FAMU was a better choice for him than Harvard, pointing to his internship offer from Lockheed Martin as an example of the opportunities available to FAMU students. For Jones, the negativity being thrown his way has only reinforced his determination to be successful at FAMU and prove that he can receive an excellent education at an HBCU. "I think that this only pushes me to work a little harder, and to show people that this was my decision and I stand behind it, and I'm not going to back down from it," he said. "I've said over and over again that I'm a major in pre-engineering. And while a lot of people get upset that I didn't attend an Ivy League institution, what they don't realize is that [at] most Ivy League institutions — while I respect them for their liberal arts programs, their law programs, their prestige, the great contributions they've made to society, etc. — their colleges of engineering are really just in name as far as prestige is concerned. For example, Harvard's [school] of engineering is still fairly new, while the FAMU-FSU College of Engineering is, I'd say, one of the best, if not the best, in the state." Questions have abounded in recent years over the relevance of HBCUs, but Jones said that he believes these schools are still very valuable for students looking for a specific type of college atmosphere and learning environment. "Everyone knows why HBCUs were founded, because of racial segregation and how African Americans couldn't attend mainstream institutions," he said. "Now that things have been righted and it is a possibility — I can attest to that — I think HBCUs are valuable now more so for the experience. "I believe Florida A&M is unlike any other college in the world just because of the HBCU experience here: the step shows, the band, the night life. It's all unique," Jones continued. "When it comes down to it, the family feeling — I didn't feel that at other institutions, because I visited a lot of schools. And this is the only one [where] I felt like I was part of something larger." Lauren Williams is The Root's associate editor.